charge on battery does last long..that's the major problem..looking like got something wrong impression about nokia asha series! AnonD-52616, 30 Apr 2012Dear freinds asha 302 has wifi issues and nokia has confirm so think twice before u buy the ph... moreLooks like, some of them (including mine) are working perfectly. But, some of them are not working at all. I wonder why. In a mean time, for those who are interesting in this phone, here is your option. 0) Just don't panic. There are still hundreds of phones out there. You don't have to buy this phone if you don't like it. 1) Wait until nokia offically announce this problem and give us the solution, unless you don't care about wifi. I am sure they are doing something right now. Do they? 2) You may ask your 302 friend to see if its ok with testing at your home or wifi spot area or even your office. But, there is a possibility that, after testing, your friends 302 will not work anymore. So, you have to tell him there is a risk, unless otherwise you loose your friend. 3) Just buy it to see if its ok. Remember, everything here is AT YOUR OWN RISK. I do not take any responsibility for anything. I would not do 2) or 3) if I were you. So, just FYI. 0) First of all, just don't panic. 1) Read your manual, google it if its available for you and try everything. A router settings, phone settings, even try opera mini. Amazingly sometimes opera mini has some advantage. 2) Use the wireless connection, which costs you a extra money, of course. 3) Give up 302. And buy new one. Remember, AT YOUR OWN RISK. I do not take any responsibility for anything. Sometimes people forget to recover the router setting or even delete their contacts while they are testing something. You think, I am lier? No. Its really happened to me and my friend too. Anonymous, 29 Apr 2012Wow, great review! I wish I could review this phone like that. By the way, I am not a nokia ... moreThanks for your vote of confidence. The Nokia 302 is not as bad as many make it out to be. As mentioned in my initial observation of the 302 (I am yet to test the product) from internet data and reviews, it may not have everything, but it certainly seems to have a little of everything. A great option for a cheap, rugged and reliable phone for the developing world. By the way, while I generally respect Nokia products I am disappointed with the company for losing its top status to Samsung. A leader in mobile phones should have had leading mobile phones. Lethargy and overconfidence has largely led to its downfall. With Nokia shares plunging by the day and with the company frequently planning to downsize its staff to cut down on costs, would you really want a Nokia job, even if Elop himself were to write you an appointment letter? You could be there today, gone tomorrow. Rafi, 29 Apr 2012Melvyn...you said itThanks for your vote of confidence. The Nokia 302 is not as bad as many make it out to be. As mentioned in my initial observation of the 302 (I am yet to test the product) from internet data and reviews, it may not have everything, but it certainly seems to have a little of everything. A great option for a cheap, rugged and reliable phone for the developing world. misquitas, 28 Apr 2012 I am rather surprised by the hostile comments (in many websites) on the Nokia Asha 302. Ag... moreWow, great review! I wish I could review this phone like that. By the way, I am not a nokia employee but I would take a job if they offer me the one. Hahahahaha. AnonD-38430, 29 Apr 2012I have not understand this.. Plz tell clearlyOh, my bad. "You can NOT take it back". 1) As he mentioned, a screen filter can reduce the brigthness at some extent. But, the problem is that, you can not test it in the dark area when you buy it, can you? 2) Let's say, its ok in the dark area. But, one month later, probably you notice its still too bright. That's exactly what happened to me. I asked my friend. He told me not to use the phone like that. AnonD-38430, 29 Apr 2012Yeah ur doctor frend said true/ri8.. Just see my N70's example, in my ph i used to set bri... moreIf you use your phone like that everyday, I really would not recommend. May be, ok with one day or one week. But, you really don't know what's going to happen after one year or even one month. May be, forgotton. But, it is still just same as PC monitor. You cannot watch your monitor in your bed like that, can you? AnonD-38430, 29 Apr 2012Wow, nice idea..! screen filters can reduce screen brightness at some extentBut, you have to be extra careful. Once you put it, you can take it back especialy the money. please tell me about streaming youtube. Anonymous, 28 Apr 2012Yeah, you're absolutely right. Its too bright. That's why I bought a screen filter so that I c... moreYeah ur doctor frend said true/ri8.. So, I would say, that's exactly nokia I know. They didn't change a bit. May be, they did. But, obviously, its not good enough for most of us. I am not sure I am answering your question. But, just get the one with 1yr gurantee card in it. That's a good one. please help....is this a anroid phone!!!!!!!! 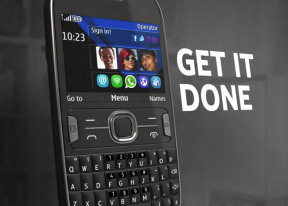 I am rather surprised by the hostile comments (in many websites) on the Nokia Asha 302. Agreed, it may not have the bells and whistles of a touch screen phone and yes, it may seem to have a "dated" operating system and interface, in comparison to an android system. But hey, not every phone user is desperate for a touch phone. On the contrary, I know of quite a few people (like myself) who want a phone for two primary features -- calls and text messages. I may love technologically and aesthetically superior phones, but at the end of the day, I want a phone that does basic tasks (calls and text messages) and moreover, does them well. And if a physical QWERTY keypad does the job -- and does it as well or better than an onscreen virtual QWERTY keypad -- why would I not like the Nokia 302? And by the way, it also helps when a phone is rugged, durable and can withstand the occasional fall. With a 4-yr-old daughter, I'm constantly afraid that my phone could accidentally fall on the ground and the first casualty could easily be the "delicate" touch screen. I am currently using a Nokia X2-01 which has fallen quite a few times. The back cover and the battery have popped out, but the Nokia X2-01 has worked just as fine whenever I put back the battery and close the cover. I'm not sure many touch screen phones within a price tag of Rs 6000 ($120) in India would survive such abuse. It sends and receives clear calls. It sends and receives text messages. It has a physical QWERTY keypad. It has a basic camera. It does NOT have a touch screen. And guess what? The Nokia 302 checks all these requirements. And it looks pretty good (premium look) as well. The fact that the 302 comes from a respected manufacturer (and not a "here-today-gone-tomorrow" company), only enhances my respect for the Nokia 302, given the pan-India after-sales service. Will it have bugs and snags? Of course, it could and any piece of technology is prone to snags. But then, I can always expect Nokia to update its firmware as and when necessary. Will I miss multi-tasking on the Nokia 302? Of course, I would. But then, it is a desirable not an essential feature for me. As I see it, when a phone offers (or promises to offer) everything, it could only mean two things. First, it will be highly priced (and beyond my means) and two, it lures the phone user to become an addict of the phone. When the phone takes over the life of its user, the user tends to live in a "phoney" world. So, when a phone (like the Nokia 302 or even some physical QWERTY phones from other manufacturers) promises the essential (not necessary the desirable) features mentioned above, I am more than happy. Why? It is bound to be an affordable phone and secondly, I know I will use the Nokia 302 only when in need. After all, there is more to life than a little piece of telephony. DISCLAIMER: I am not a Nokia employee but happen to be a journalist (40) based in Goa-India, who has an avid interest in technology and gadgets.